A nice piece of detective work really. The Bowling Green Farm was on Beech Road between Beaumont and Reynard Road. The first reference to it is in 1871 , but it was there ten years earlier and still appeared on maps as late as 1907. From the 1860s the Langford family had the farm and were still there in 1901. Above; The Bowling Green Farm date unknown from Tony Walker’s collection. By 1861 Whitelegg had left the pub and was farming on the Green. 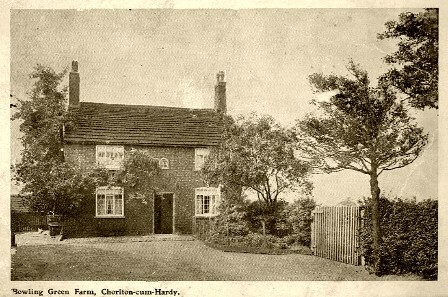 For most of the nineteenth century it was known as Chorlton Green Farm and the family continued to run it into the twentieth century. They prospered and the farm grew from 22 acres to 52 employing seven farm labourers for most of the time. And here was the problem, because by the time George Whitelegg was established on the Green, the Langford’s were living and farming at the Bowling Green Farm. So the assumption that the Bowling Green Inn was also the farm was wrong. But with all detective work it was just chance that in following up on the Bailey family who ran Holly Farm on Beech Road I came across the Langford’s on the same census return. They had moved from Oswald Field where Peter Langford had described himself as a market gardener of one acre to Chorlton Row (Beech Road) sometime between 1851 and 1861 . This was clearly a step up because in 1861 he farmed 16 acres described himself as a farmer and employed two labourers. The family remained there until at least 1901 and maybe beyond. The farm was first recorded as the Bowling Green Farm in the 1871 census. The Langford’s seem to represent a typical Chorlton farming family. They variously describe themselves as farmers and market gardeners throughout the nineteenth century. As a farm it was much smaller than many of those in the township, but looks to have been one of the bigger market gardens. One of Peter’s sons ran a market garden on St Clements Road and lived in Jasmine Cottage. Another Langford family farmed Red Gates Farm in the 1860s and 70s and were buried in the parish church. Another was gardener and hall keeper at the Masonic Lodge in the last decade of that century and yet another was a wheelwright. Left; The Bowling Green Farm facing Beech Road, from the 1907 OS map. By then the farm had been encroached by the Reynard Road development. Peter Langford does not feature on The Post Office Directory for 1870 which listed most of the farmers and market gardeners. So far it has been impossible to discover who ran the enterprise before 1861. One possible candidate is Samuel Gratrix. He is listed as living on Chorlton Row in 1841, and ten years later his widow was still in Chorlton. According to the 1847 Tithe Schedule, Samuel was farming land which was close to the site of the Bowling Green Farm. In total this amounted to about 8 acres and fits with the size of market gardens for the period. Ten years later his widow was still farming six acres. We do have to be a little careful however because land tenure in the township did not reflect the neat or conventional idea of how land was distributed. Many of the farmers and market gardeners had their land spread out across Chorlton, in what seems an echo of earlier farming practices. Under the old strip farming, each villager had a share of each of the fields cultivated and these were not always close together. Never the less it does seem possible that what was to become the Bowling Green Farm was where he lived and farmed. 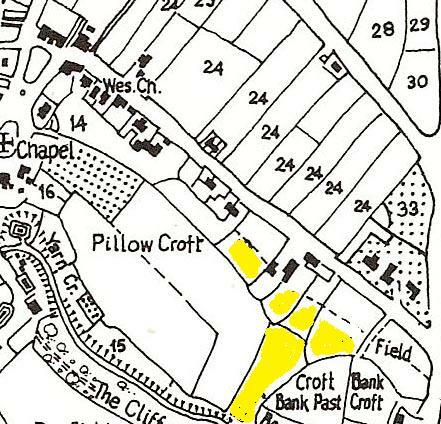 The land marked in yellow on the map opposite represents most of the land he farmed in 1847 and it was on Chorlton Row where he lived in 1841. The buildings in the centre do resemble those shown on the 1883 and 1907 OS maps. So far there is no date for when the farm closed. 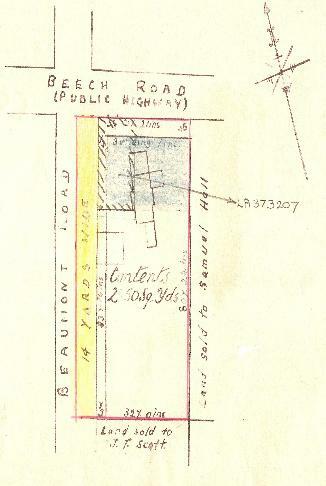 It appears on the 1907 map and various postcards from 1906 through to 1909 show that side of Beech Road as open land. But the slow encroachment on the farm land began in 1907 after the publication of the OS map with the building of a pair of semi detached houses on what is now the corner of Beech Road and Reeves Road. The final episode in its history began sometime in the 1930s when the land with the farm building was bought by Joe Scott the builder. Perhaps just before 1936 the farm house was demolished and the present house on the site was started, although the war may have delayed its completion. At roughly the same time another parcel of land beside the farm house was bought by Samuel Hall who may then have constructed the adjacent two houses. This dating would fit with the development of the houses on Beaumont Road. 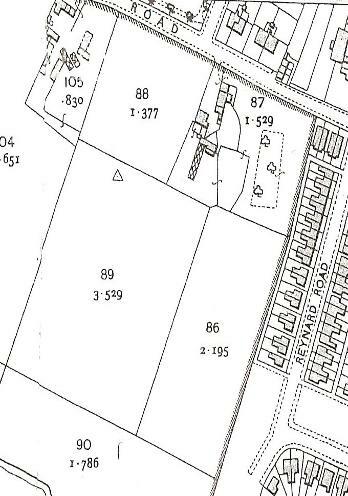 A plan of the plot of land exists which shows the outline of the farm building and this building outline corresponds with the farm house which shows up on both 1883 and 1907 OS maps. So we can be fairly confident that not only have we found the Bowling Green Farm but that we have a date and an explanation for its end. And that is not the end of the story. Alan Cook who owns the house which sits on the site has found some physical remains of the farm house. In putting in the footings for an extension he came across the footings of an earlier building. The bricks were handmade which dates the original farm house to the first quarter of the nineteenth century. He also recovered a piece of stone slab which had been painted with red lead. No documents belonging to the Langford’s have so far turned up to complemented the physical remains of their home. And we have nothing which matches the collection of receipts, and bills that have survived from the Bailey farm just a few hundred yards further down Beech Road, but I have confidence that something will turn up. Above; Beech Road 1906. What makes this postcard just that bit more remarkable is the message on the back from Jim who told Edith from Canada that the cross showed where they lived, and that they had had “afternoon tea on the lawn” of Beech House opposite. From Philip Lloyd’s collection. Below; Beech Road looking towards Barlow Moor Road. The postmark is dated 1906 but the original may be much older. In a later picture dated 1909 the ivy almost covers the entire frontage of the building. The next step is to try and find people who knew the farm. This may not be such a difficult task given that the building if not the farm was still in existence in the 1930s. If the last few months have shown anything, it is that out there lots more people have vivid memories of the farms of Chorlton.